This mayoral race has been full of outlandish claims and surprise proposals. But this one might take the cake for the most ridiculous. In the 1960s there was massive public outcry when the city proposed creating the Spadina Expressway above-ground. 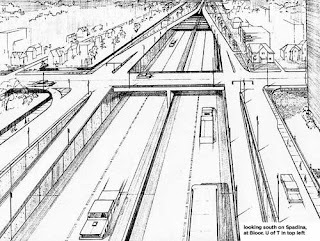 But now, a revamped plan introduced by Rossi proposes that the Spadina Expressway be reconsidered as an underground project. He proceeds to pull a figure out of thin air of $110 million per kilometre figure for the project. But…come on. That’s just the cost of the construction, if it covers even that. Think about the productivity lost during the construction of such a project. We don’t want to recreate the Boston Dig here, but that’s what Rossi is proposing. I get that he wants to decrease congestion to encourage businesses to open in the downtown core, but I don’t think this is the best solution. And he’s right. This massive construction project would be similar to a bomb hitting a major area of downtown. Although Rossi believes that putting the expressway underground will negate the protests of the 1960s which included noise pollution and degradation of residential areas, he’s beating a dead horse. This is a stupid plan. Stupid, stupid, stupid.